The African School of Fundamental Physics and its Application has been established to build capacity to harvest and interpret the results of current and future physics experiments with particle accelerators, and to increase proficiency in related applications, such as medicine, and technologies, such as IT. The School is a non-profit organization, which provides partial or full financial support to 50 of the selected students, with priority to Sub-Saharan African students. The lectures are addressed to students in Fundamental Physics with at least a background of 4 years of university formation. Lectures may be an interesting complement for PhD academic lectures. Depending on circumstances we may consider opening the school to young researchers as well. Please find the final report of ASP2012 Activities here. With great pleasure, we share the footage of ASP2012. Also ASP2012 is featured on the CERN News Bulletin, here is the link to the article. Check out the article about ASP2012 in the BNL Bulletin here. As well as the report on the "Fermilab Today". 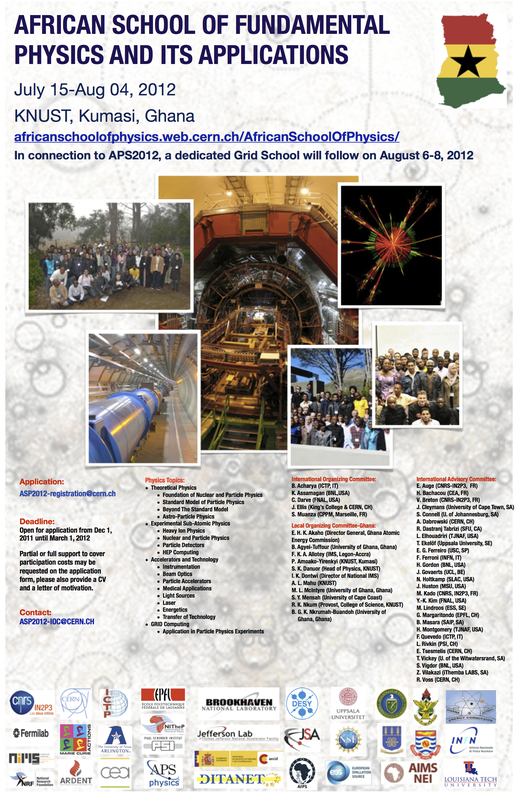 In connection to ASP2012, a dedicated Grid School will follow on August 6-8 2012. The draft Timetable of the summer school is available on the School Program Page. Please click on the Indico Link.